The Royal Collection is one of the world's great art colletions. It includes morellections than 7,000 paintings and some 200,000 watercolors, drawings and prints as well as furniture, tapestries, books, photographs and other works. While the numbers are impressive, the quality is even more so. Artists such as Leonardo Da Vinci, Raphael, Michelangelo, Rembrandt, Rubens, Holbien, Vermeer, Monet and all of the great British portrait artists are represented. Whereas royal collections in other parts of Europe have been nationalized, the Royal Collection is distinct from Britain's national collections. It is the property of the monarch although it is held in trust by her for her successors. Although the Royal Collection is extensive, it is not comprehensive. Accumulated over the centuries by various monarchs, the collection reflects the tastes of the individuals rather than an academic effort to have the collection trace the history of art. Some monarchs were avid collectors. Charles I assembled a magnificent collection. However, the vast sums that he spent angered the people and contributed to his downfall. Similarly, George IV was severely criticized for his spending on art. But the Royal Collection and with it the public now benefit from his legacy. Such a vast collection cannot be displayed in one place. Instead, it is distributed across the various royal residences. Some of these, including Hampton Court, Kensington Palace, and Windsor Castle are open in whole or in part to the public. Works from the Royal Collection can also be seen on loan to various museums. The Queen's Gallery at Buckingham Palace was created to exhibit works from the Royal Collection. A relatively intimate portion of the Palace, the Queen's Gallery displays approximately 450 works from the Royal Collection at a time on a rotating basis. The Queen's Gallery stands on the site of a conservatory designed by architect John Nash and completed in the 1830s. In 1843, Queen Victoria had the conservatory converted into a private chapel. Nearly a century later, during World War II, the building was destoyed in the bombing. After the war, the Queen had this area redeveloped as a public gallery for the display of works from the Royal Collection. It opened in 1962 and in this incarnation hosted some 37 million visitors. In anticipation of the Queen's Golden Jubilee, a 20 million pound expansion project was undertaken. This tripled the size of the Queen's Gallery. The Queen opened the new version of the Gallery in 2002. One of the new additions was a new entrance. Recalling Nash's use of Ionic columns elsewhere in the Palace, the entrance resembles a small Greek temple. 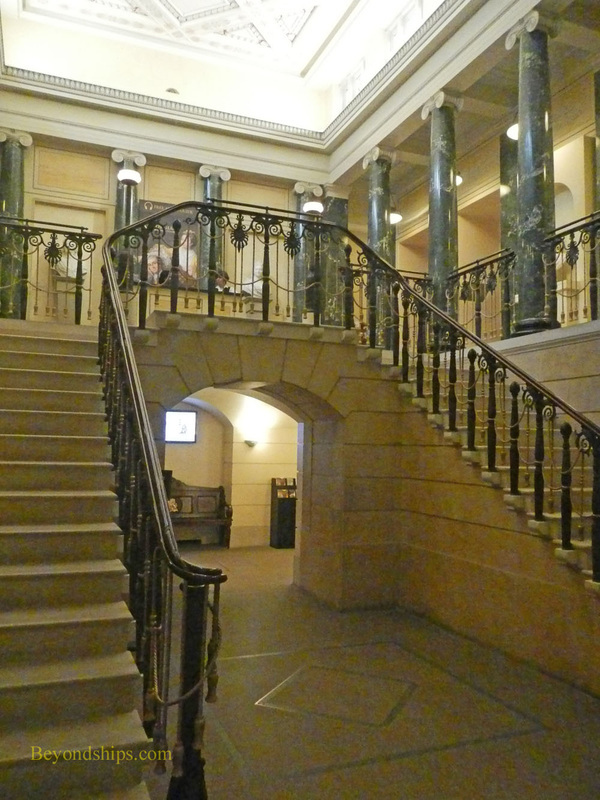 Once inside and past the security checkpoint, you come to a room with an impressive staircase on either side. Upstairs are the exhibit rooms. On this level, there is a large shop on the left hand side. Straight ahead are restrooms and other facilities. There is no permanent collection on display at the Gallery. Rather, temporary exhibitions are assembled from works in the Royal Collection according to a theme or concept. An exhibitions runs for several months and then is replaced by another exhibition. The exhibit space includes three large rooms. These can be arranged in various configurations in order to suit the needs of the exhibition. The lighting shows off the works but is not glaring or hard on the eyes. While the Gallery is of relatively recent construction, the interiors nonetheless have the atmosphere of a palace. They are not opulent and do not compete with the works on exhibit but you do have the feeling of being in a house rather than a museum. An audio tour is included in the price of admission. In addition, the Gallery offers lectures, concerts and art courses. The Queen's Gallery is located on Buckingham Palace Road, which is the road along the left side of the Palace as you look at the main entrances of the Palace. See the Queen's Gallery website for further information.